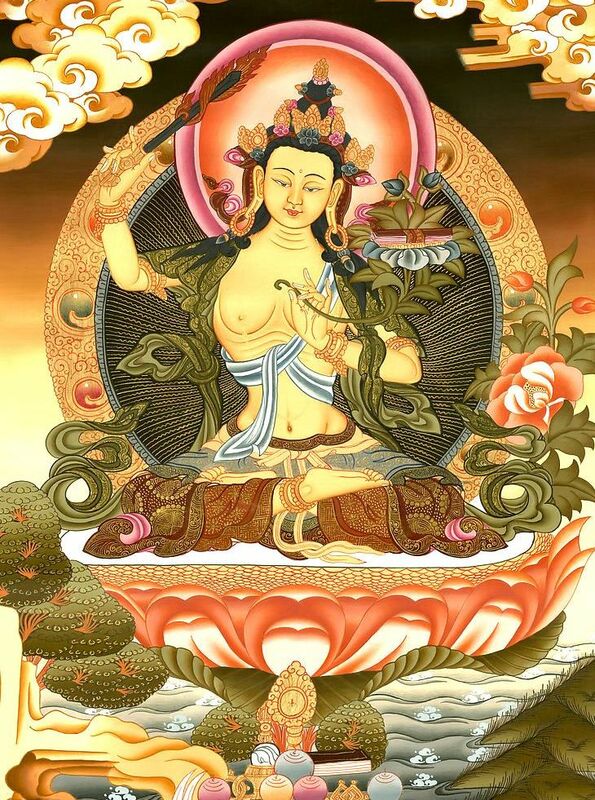 Manjushri is the bodhisattva of transcendent wisdom. He carries in his right hand the double-edged sword able to cut through illusion and with his left hand a blooming lotus that supports a book, the Prajnaparamita Sutra. In the Buddhist pantheon he is depicted as a youth of sixteen years in order to convey the Buddhist insight that wisdom is not a matter of mere experience or years., but results from the cultivation of intellectual genius, which can penetrate directly to the bedrock of reality. Wisdom is the most honoured virtue in Buddhism, called the Mother of all Buddhas, since only wisdom makes possible the great bliss of total freedom from all suffering that si the goal of all living beings. 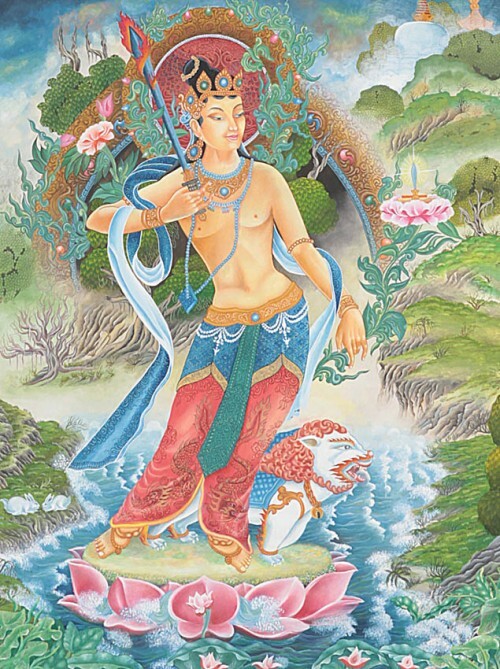 The first day of the year is dedicated to Manjushri. He is looked upon by certain sects as the god of Agriculture, by others as the Celestial Architect, and is believed to have inspired with his divine intelligence those who have been active in the propagation of the Buddhist doctrine. He is the god of science, and swings his sword of wisdom with its flaming point to dissipate the darkness among men, to cleave the clouds of ignorance. The Chinese say that when he preaches the Law every demon is subjugated, and every error that might deceive man is dissipated. He is an extremely popular deity in all the Northern Buddhist countries, and one often sees his image in magic paintings, charms, and mandalas. 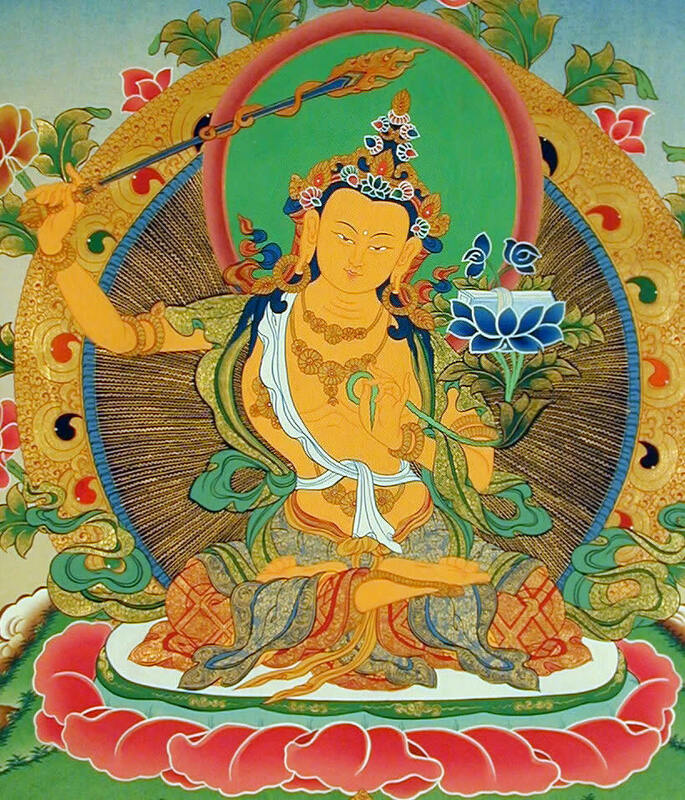 In the four corners of the painting can be seen four different forms of Manjushri. In the upper left corner can be seen In his form called Manjughosha. In this form both the sword and book are supported by lotus-flowers and the stems are held by the hands. In the upper right corner can be seen Manjushri in his four-handed incarnation. In the lower left corner is the White Manjushri called Siddhaikavira. His right hand is the varadamudra and left holds the stem of a lotus, which supports the book and sword. 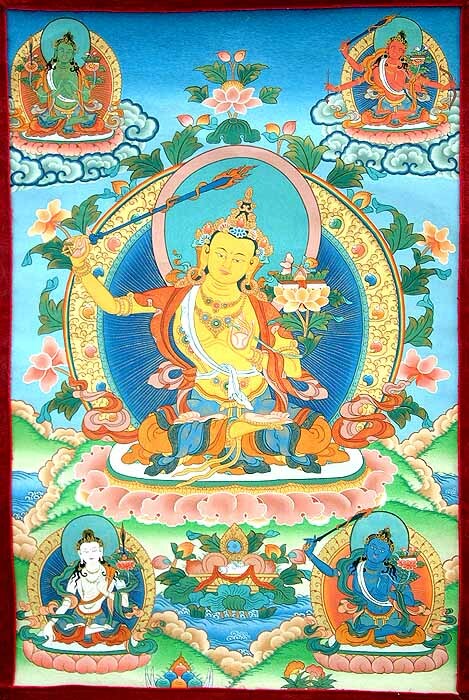 The figure in the lower right corner is similar to the central image, other than it is a manifestation of Manjushri in blue color.